You’ll hear it frequently, but it’s true. More does indeed happen here. How? ​The “more” is hard to define, but lies within the extra opportunities through which our students thrive. High caliber faculty, stage lighting for our drama performances, musical instruments, art supplies, athletic equipment, field trips, and every adventure inside and outside of the classroom; they all happen because of the generosity of those who believe all students do better with more experiences within a more diverse community. From Tailored Tuition to Robotics Club, landscaping to iPads, tether balls to outstanding athletic facilities, we do more for our students because you do more for us. Whether as a one-time annual pledge or through a planned gift, we thank you. By making installment payments online, use the form on this page to make secure gifts to The North Cross Annual Fund and choose the installment option. We accept Visa and MasterCard. Contact the development office at 540-989-6641 to speak to Jennifer Burtch at extension 284, and she will assist you in making a credit card gift over the phone. Corporate matching gifts provide a wonderful opportunity to double, sometimes even triple your contribution to North Cross School. Please contact your company’s personnel office for specific information about your employer’s matching gift program. It is necessary in all cases for the donor to secure the proper forms from the corporation and to submit them to School in order for us to receive the matching gift. Securities such as stocks and bonds can be used to make charitable gifts to North Cross. You are entitled to a charitable deduction (both income tax and estate or gift tax) equal to the mean trading value of the securities on the date of the gift. One of the principal benefits of a gift of securities is that any appreciation is exempt from capital gains taxes. Electronic transfer is the preferred and simplest method for stock transfer. First, notify Jennifer Burtch, Development Coordinator, in the Development Office, 540-989-6641, ext. 284 or jburtch@northcross.org. If this is not done prior to a transaction, the identity of the donor may be in jeopardy and the gift may not be received into our account properly. Second, have your broker call or email Jodie Wertz at the Roanoke office of Morgan Stanley Smith Barney 540-983-4907 or Jodie.Wertz@morganstanley.com) to advise her of the symbol or security description, approximate number and value of shares you intend to give, and if you want the gift to be for any special purpose. Please note in the memo line what the donation is for, if you have the option when you make the gift, i.e. Annual Fund, Capital Campaign, etc. North Cross School’s account number is 936-107507-046 and our “DTC” transfer number is 0015. Stock certificates may be sent via certified mail to either Morgan Stanley Wealth Management or North Cross School. Write a letter of instruction to Morgan Stanley Wealth Management stating your intentions for them deposit the stock into North Cross’s account (936-107507-046). Send to Jodie Wertz, Morgan Stanley Wealth Management, 10 S. Jefferson St., Suite 1700, Roanoke, VA 24011. A related stock power must be guaranteed by a bank officer or investment broker using the Medallion signature guarantee stamp. Do not sign or write anything on the stock certificate itself. Place the certificate and the stock power in separate envelopes to ensure security. Send to Joanna Coleman, Director of Development, North Cross School, 4254 Colonial Avenue, SW, Roanoke, VA 24018. Would you like to make a pledge instead? Email Jennifer Burtch at jburtch@northcross.org to fill out a form. To spread out the payment of your pledge or gift, you may pay in monthly installments. Each month your credit card is billed the monthly amount you decide. Continue the installments as long as you wish, or if you wish to stop them, simply email Jennifer Burtch. 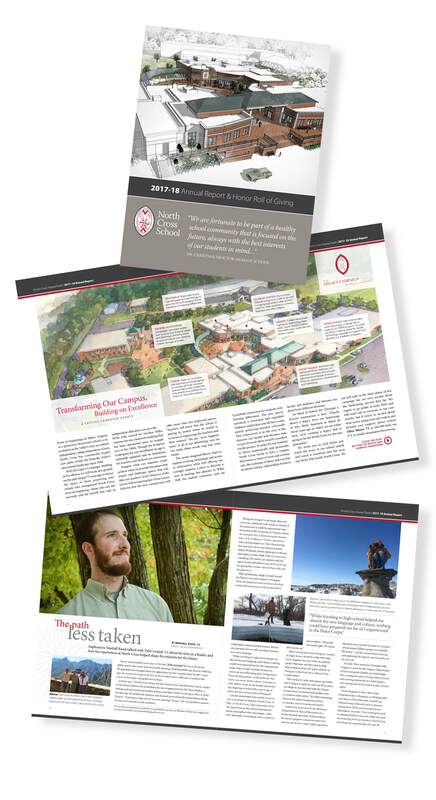 The Annual Fund supports the faculty and students through the School's operating budget. Should directed contributions exceed a fund's budgeted limit, the School's administration reserves the option to direct the use of such contributions to the area of greatest need. Our fiscal year runs from July 1–June 30. To make sure your gifts to the Annual Fund are applied to the correct Giving Societies and Clubs (shown at the right), please make sure your gifts are given during this timeframe. Including North Cross in your estate planning not only helps the school succeed in its mission, but it is also a great way to lessen your tax burden. Simply put, would you rather your hard-earned money go to a government entity or to a child who craves a creative and challenging educational experience? For more information, visit our Planned Giving page or contact our Director of Development, Joanna Coleman, for more information and illustrated scenarios. Each year, the North Cross School Foundation will provide roughly $350,000 in scholarships and financial aid to area students who otherwise would not be able to afford tuition. Recently, the school was approved to participate in the Virginia Education Improvement Scholarship Tax Credit Program which allows donors who participate to receive a 65 percent state tax credit in addition to deductions they already take. Individuals are able to give up to $125,000 and receive this tax benefit, while a corporation’s qualifying donation has no limit. Any individual, or any business, with tax liabilities in the Commonwealth of Virginia can participate. Contact Joanna Coleman for more information. ​If you'd like to speak directly with our development team, please don't hesitate to reach out. Call 540-989-6641 ext. 284 or simply e-mail Jennifer Burtch. Mrs. Charles L. Crockett, Jr.